Erbazzone is a savory vegetable pie from Reggio-Emilia in Emilia-Romagna. Greens are sautéed with onion and pancetta and enriched with Parmesan cheese, encased in a crust made from an unleavened dough of flour and water enriched with oil or lard called pasta matta, and then baked. Simple, honest food, made from humble ingredients in the cucina povera tradition. 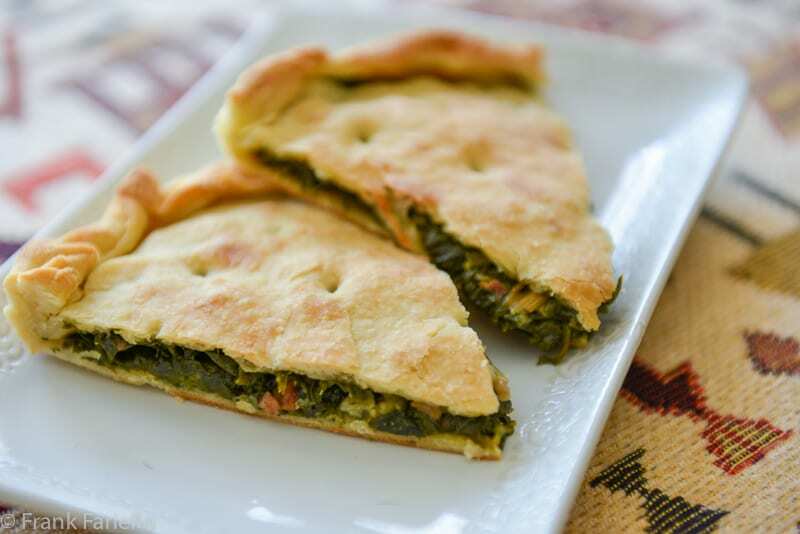 Erbazzone strongly resembles the pizza di scarola (escarole pie) of Campania, and in fact at least one source says they share the same ancient Roman ancestor. Truth is, this kind of simple vegetable pie can be found all over the Boot. A popular street food in its homeland, for the rest of us erbazzzone makes for a healthy—but terribly addictive—snack or antipasto. Pulse together the flour and salt in a food processor. Add the lard or olive oil and pulse until well incorporated. Add the water, bit by bit, processing steadily, until a ball of dough forms. Transfer the dough ball to a board and knead lightly for a moment. The dough should be soft and quite pliable. If it’s sticky, incorporate a bit more flour. Dust the dough with flour, then wrap in a towel or plastic wrap and set aside for at least a half hour. If your greens aren’t sold pre-washed, rinse them well, in several changes of water if necessary. Parboil the greens in salted water just until wilted. Drain under cold water until they have cooled off. Then squeeze them dry and chop them roughly. Make a soffritto by sautéing the pancetta, onion and garlic in some olive oil. Add the chopped greens and mix well. Let the greens absorb the flavors of the soffritto for a few minutes over moderate heat, seasoning generously as you go. Let cool completely, then mix in the parsley and grated cheese. Divide the dough in two. Roll out one half into a thin round, then lay it over a well-greased baking pan about 27cm/11 inches in diameter. Lay the filling out all over the bottom of the pan. Roll out the other half of the dough and lay it over the filling. Trim off the excess dough and crimp the edges. Prick the top layer of dough all over with a fork or a skewer. (This step prevents the top crust from puffing up.) Then brush the dough with olive oil. Bake in a hot (200C/400F) oven for a good 30 minutes, until lightly browned on top. Let your erbazzone cool until just slightly warm. Cut into slices and serve. It is also quite nice at room temperature. Pasta matta is an excellent all-purpose pie dough well worth adding to your repertoire. I find it easier to work with than pate brisée, both more supple and elastic, and it doesn’t need chilling to be workable. 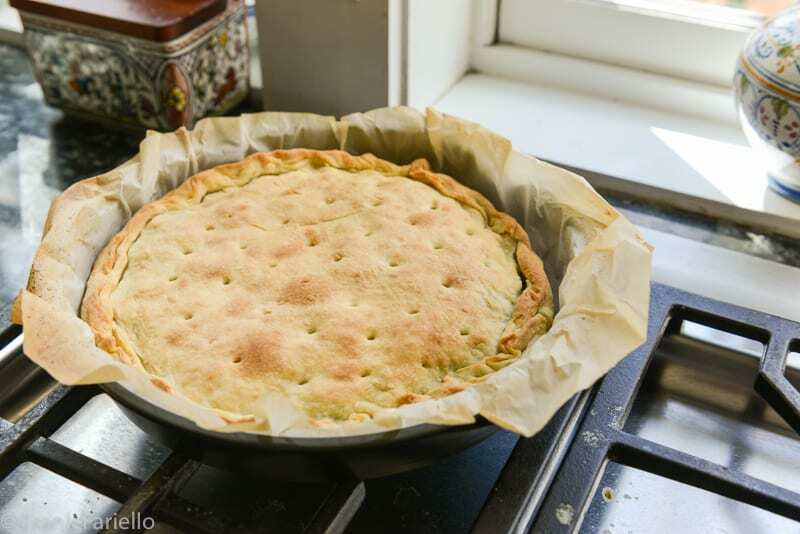 It can be stretched out very finely if need be, even paper-thin as when making a torta pasqualina or strudel. With its lower fat content, a crust made with pasta matta comes out crispy rather than flaky. It can be used in both savory and sweet recipes. One trick that makes easy work of lifting the erbazzone out of the pan for slicing and serving: Cut out a piece of parchment paper large enough to line the bottom and sides of your baking pan. Grease the paper well and lay the bottom layer of dough on top of the paper, then transfer paper and dough to the pan and proceed from there. Most Italian recipes for erbazzone call for rather more greens (a full kilo/2 lbs) and a rather wider baking dish than called for in this recipe. I found the measurements provided here provide a nice balance of crust and filling, plenty as a snack or antipasto for 4-6 people. But you can play around with measurements and sizes to suit your taste and appetites. Erbazzone was traditionally baked a round copper pan, but it can easily be made in a rectangular one, too. It doesn’t really matter. It can, in fact, be any shape you like. Some people make a “free form” erbazzone, laying out a round of dough, a bit like a pizza. on a flat baking sheet, and proceed from there. But however you make it, do remember, an erbazzone should not be ‘deep dish’ pie in the way, say, a torta pasquilina is. In the most traditional recipes, half the soffritto is held back and used to top the dough a few minutes before it’s done. Sounds savory but a bit messy. By contrast, in some other recipes you brush the top with egg yolk for a more lustrous, golden crust. Most erbazzoni though appear to be blonds rather than brunettes. Erbazzone is hardly a meaty dish, but like many recipes in the cucina povera tradition, it includes just a bit of meat for flavor. You can easily make your erbazzone vegetarian by omitting the pancetta from the filling and using olive oil instead of the lard for the crust. Pulse together the flour and salt in a food processor. Add the lard or olive oil and pulse until well incorporated. Add the water, bit by bit, processing steadily, until a ball of dough forms. Transfer the dough ball to a board and knead lightly for a moment. The dough should be soft and quite pliable. If it's sticky, incorporate a bit more flour. Dust the dough with flour, then wrap in a towel or plastic wrap and set aside for at least a half hour. If your greens aren't sold pre-washed, rinse them well, in several changes of water if necessary. Parboil the greens in salted water just until wilted. Drain under cold water until they have cooled off. Then squeeze them dry and chop them roughly. Make a soffritto by sautéing the pancetta, onion and garlic in some olive oil. Add the chopped greens and mix well. Let the greens absorb the flavors of the soffritto for a few minutes over moderate heat, seasoning generously as you go. Let cool completely, then mix in the parsley and grated cheese. Thank you so much for this delicious recipe. We’re just back from Italy and as usual, are struggling to come to terms with our very nice local Canadian meats, cheeses and produce vs. the spectacular Italian originals that we could get at any corner market. This one really makes it work without the hair pulling that I usually go through when something doesn’t QUITE make the taste grade. I really look forward to your posts and the accompanying stories. Thanks so much, Cora! It can be a real come-down when you compare Italian products with their counterparts elsewhere. Thanks so much for your kind words and your readership! You bake such beautiful things! I want to come over for dinner! You’re welcome any time, Jeff! Thank you sooo much for the amazing recipe Frank! This was excellent Frank! I used a smaller pan so I could have some of this fabulous dough left over. I also sautéed extra pancetta, removed from pan and added it to the leftover dough, squished it in with red and black pepper and baked it. It was so delicious!! My grandmother used to make the lard bread and I certainly miss it and this reminds me of it. I think next time I’ll add a handful of raisins— isn’t that Sicilian? Thank you for the great recipes! What a fabulous dinner this will make! I have never made Erbazzone and I must try your recipe soon! Definitely worth a try… ! I am all about the savory. On my agenda. This looks like the perfect Brunch dish, I might even top it off with a poached egg. The crust looks like it’s perfectly proportioned to the filling. A tasty recipe that should be enjoyed in the garden but Mother Nature has other ideas about that, snow and freezing rain until Thursday, what fun. Sounds nice, too, Paola! And I don’t know the translation, either…! I’ve seen it translated as “fresh herbs” but that really doesn’t do it, does it? This sounds like an incredible recipe, Frank! I must admit that I’m not familiar with erbazzzone, but it’s got all of the customary Italian ingredients that would lead to one delicious pie. I mean the combo of pancetta, parmesan and spinach is making my mouth water right now! I definitely need to put this one on the list. We’ll actually be near that area in a couple of months on vacation, so I’ll have to keep my eye out for erbazzzone! Thanks for sharing the background here, too! And thank you for stopping by, David! I think you’d like erbazzone, so do check it out if you’re in that part of Italy. And enjoy the trip! I had this last August (actually it was Ferragosto) when I went to an Italian restaurant in downtown LA, and I loved it! Had never heard of it before. We make a similar “pie”, but it’s made with bread/pizza dough. Thanks for the recipe, Frank! Now I can make it, too! Ah yes, the escarole pie I also make uses pizza dough. Also great, although the pasta matta does make this much lighter on the old tummy. Worth a try! Well, then, this really is just the ticket for you, Cristina! Do let us know how you like it. That lardo would add fantastic flavor, David, as I’m sure you know. As for the lard, well, I buy it online myself. There’s a stall at the local farmer’s market where they’ll sell you lard if you remember to order it ahead but I’m just not that organized! what’s not to like?! I went through my erbazzone phase last year and I found excellent. I agree with u: the soffritto business on top….is rather messy and I eventually omitted. Using lard.. I have to admit that (good) lard makes a difference to the crust – my cooking has become almost entirely vegetarian BUT a lard based pastry is pretty unbeatable, in terms of crispiness and flavour. as u will see it is miles away from the simplicity of the erbazzone but it plays on the same them: using greens to make something remarkable. Interesting recipe! I’m curious about that taste combination. I’ll definitely have to try it out. Small world… Thanks for stopping by! Sure, absolutely. As mentioned, the crust will be thinner and crispier than the leavened crust that recipes calls for. I love these pies. The Argentine pascualina is usually made with chard (acelga in Spanish) because Easter there is in early autumn and the spinach has bolted by then, but of course there is always frozen spinach. I sometimes make a crust like that but add a tiny bit of yeast (as a pouliche). Mala, what are patience dock leaves – in Italian, per caso? Such a nice dish! I love greens in pies like this, and Swiss chard is a real favorite. We always grow quite a bit every year, and its season is so long, we’re always looking for nifty recipes for it. This is perfect! Thanks. Well, it sounds like this recipe is for you, John! Thanks for stopping by. Your Erbazzone would make such a great lunch or snack. I am intrigued by your pie dough. It’s a good one to add to your repertoire, I think. I’ve never heard of Erbazzone. It looks wonderful! This pie really is phenomenal ! My grandmother used to use spinach, wild garlic or patience dock leaves to make this pie and the result is exceptional. I can well imagine it is! Sounds like a nice combination of greens. And to anyone who may be wondering (as I was), patience dock is Rumex patientia, a common leaf vegetable in Balkan countries.